Why do a Septic Tank System Inspection? system for the foul drainage. Most people buying country houses have never had a septic tank before and have no idea about how to decide whether it is a good, functioning system or one that needs replacing. Replacement of a septic system is very expensive and likely to cost upwards of £5000, so it is vital to find out if it is in good working condition and that the discharge is into a soakaway drainfield and NOT into a ditch, as this is illegal. Very often, the original discharge point was into a soakaway, but soakaways do not last forever. When they block it is an immediate serious problem and if there is a land drain in the vicinity, the effluent was often illegally tapped into it, discharging into a ditch somewhere. Your Solicitor will probably recommend that you have a sewage system survey undertaken before purchase, but these can be very expensive, costing anywhere up to £2000 - money which is often not available when you are purchasing a house in the country. This article gives you the tools to conduct your own septic system survey. The septic tank system must comply with the General Binding Rules. The best way to find the septic tank is to ask the current owners where it is. They should know as it ought to be emptied by a tanker every year, however, many people are under the false impression that it never needs emptying and have no idea where it is located. If this is the case and they have lived there for several years, doubts should already be forming as to the state of the septic tank soakaway which could be silting up with suspended solids that are coming out of the septic tank outlet! 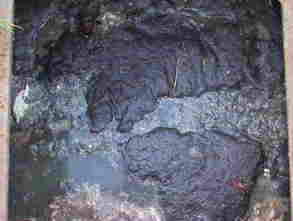 Always ask the owner when the septic tank was last emptied, by who and check that this is correct. Lift all the manhole or inspection chamber covers. There should be an inspection chamber wherever 2 drains join or where a drain changes direction, though they are often missing. From the last inspection chamber, follow the line of direction of the outflowing drain. Drains from this last chamber are usually in a straight line to the septic tank. You may find more inspection chambers as you follow the drain. Walk along the line and poke with a pointed metal stick (an electric fencing stake is ideal) at every stride in case the tank lids are covered with soil or vegetation. The tank is usually within yards of the last chamber, but they can be a long way away, so keep walking. You will eventually find it. A modern 'onion' shaped septic tank, in which case there will be only one lid with a 'tube' of around 600mm. diameter leading down and the open top of a 'pipe' visible at either side. A traditional 2 chamber septic tank which can be made of concrete, brick, block, plastic or fibreglass. This may have one lid in the centre of the divider between the 2 chambers or two lids, one over each chamber. These septic tanks usually give a better effluent quality than the type above. Occasionally, there is only a single chamber in the tank. If the tank is the first type, there is little you can do to inspect it as you can only see down the tube. However, you should be able to find out if the effluent is at the correct level or if the tank is 'backing-up' from the soakaway. The liquid level should be no higher than the bottom of the outlet from the tank. You can find the bottom of the outlet by using a garden cane. Imagine the pipe that you can see is the top of a capital 'T' on its side. The shaft of the 'T' is the horizontal outlet pipe and what you can see is there to enable you to rod down and clear any blockages that may occur at the 90 degree bend. Slide the garden cane down the OUTSIDE of the pipe on the furthest side from the house. The cane should find the outlet and catch on the horizontal pipe base that is the outlet on the 'T' fitting. Pull the cane out and measure the depth to the outlet pipe base. The water level in the 'tube' should be no higher than this, or you have trouble with the soakaway! If the water level is lower than this, then it is likely that the tank is fractured and leaking. If the septic tank is the second type, you should be able to see all of the tank. Make sure that there are 'T' pipes on both the inlet and, very importantly, on the outlet. These 'T' fittings stop any floating solids from going down the outlet and blocking the soakaway. If these are missing, then they will have to be fitted. There should be a 'crust' on the first chamber. It looks disgusting - brown chocolate mouse coloured, but is a sign of a healthy tank. The water level in the second chamber (or the single chamber if it is a single chamber tank) should be no higher than the bottom of the outlet pipe. If you can't see the outlet pipe, you have a problem as the tank has a compromised soakaway and has 'backed-up'. If the property is occupied and the water level is lower than the bottom of the outlet pipe, then the tank is probably leaking and will need to be replaced. Have a good look at the sides of the tank. If you can see 'tide marks' of previous higher water levels, then this indicates that the soakaway has problems, probably in times of wet weather or when visitors increase the flow rate. Inspect the sides of the tank carefully. If you see any signs of corrosion, mortar joints that have eroded, etc, then the tank is coming to the end of its life. Inspect the cover very carefully. Septic tank gases include Hydrogen Sulphide, which converts to Sulphuric Acid on contact with damp surfaces, and this eats into the concrete. Many people are killed every year because of collapsing septic tank covers, so never stand on it. 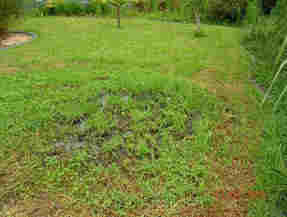 A drain inspection is required to acertain that the correct drain have been connected to the septic tank. No rainwater can be allowed to enter the septic tank from the roof gutters as this flushes the sewage straight through the tank blocking the soakaway. there is either a problem with the gradients of the drain system or the septic tank has 'backed-up'. One person monitors the last inspection chamber before the septic tank and another person pours water, coloured with dye (food colour is fine) into the gutter downpipe or gutter drains. If coloured water is seen at the last inspection chamber, then the septic tank is connected to the surface water drains and this has to be rectified. Re-routing drains can be a costly business. Inspect the condition of the inspection chambers and drains. There should be no corrosion or cracking. This is very hard to do as all parts are hidden below ground. Ask the owner where the septic tank soakaway is situated and have a close inspection of the ground in that area. Differences in vegetation. Some plants like wet ground conditions and there may be a difference in vegetation, grass species, ect. if the soakaway is compromised. Above all, make sure that the septic tank actually has a soakaway. Many older septic systems were discharged directly into ditches, streams, etc.This is illegal and will need to be rectified, either by installing a new soakaway, IF the ground is suitable, (although over 60% of sites fail the soakaway tests and cannot replace the soakaway), by adding a septic tank conversion to the system after the septic tank in order to clean the effluent to a standard that can be discharged to the watercourse, or by installing a sewage treatment plant. The latter is always the cheaper option. If the septic tank is no longer watertight, then the entire system will have to be replaced with a sewage treatment plant, which can be non-electric. Trees and hedges in the vicinity of the septic tank or the soakaway. Tree roots will find water and can completely block the drains or fracture the mortar joints in the septic tank. Septic tanks and water softeners. 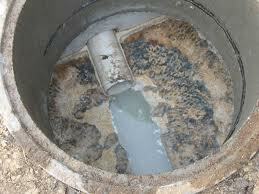 Make sure that the salt backwash water does not enter the septic tank as the salt will kill the beneficial bacteria. Septic tanks and High Efficiency boilers. Make sure that the condensate does not enter the septic tank as this is very acidic and will also compromise the bacteria, as well as compromising the alkaline concrete and mortar joints. If the soakaway is in a field, make sure that tractors and farm machinery cannot run over it. They will squash the air out of the soil and ruin the soakaway. Good luck with your survey. Sewage systems are expensive to replace, so all inspections need to be thorough.